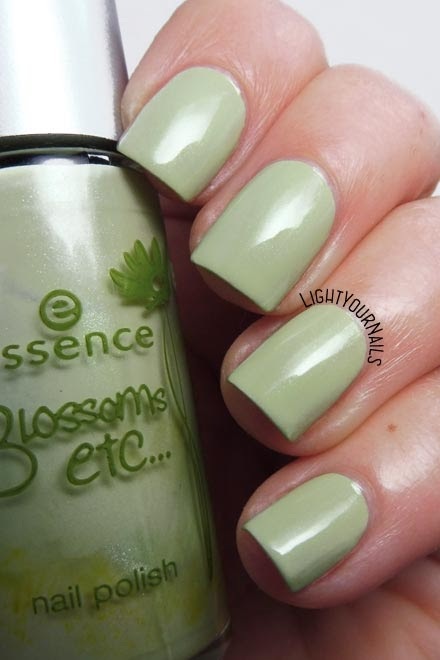 Essence A Hint of Mint (Blossoms Etc. TE) | Light Your Nails! A perfect Spring shade for Pantone's Spring-Summer 2018 colour palette: PANTONE 14-0121 Nile Green. "Calm and composed Nile Green is a breezy light green that brings a breath of fresh air to the palette, working well as a serene base for a myriad of shades in the Spring 2018 palette". This time I think I did the right colour choice picking Essence A Hint of Mint, from an old Trend Edition called Blossoms Etc. It's a mint green with a subtle silver shimmer. Application needs some extra care as you might expect from a pastel shade. You have to wait for the polish to be completely dry before applying another coat otherwise you'll drag the colour underneath. Drying time is quite slow and you need 3 coats for a perfect coverage. Lasting time is not that great either. It's such a pretty shade, although it doesn't make me think of Nile! It would make a perfect Spring nail art base anyway. Beautiful shade, perfect for spring!